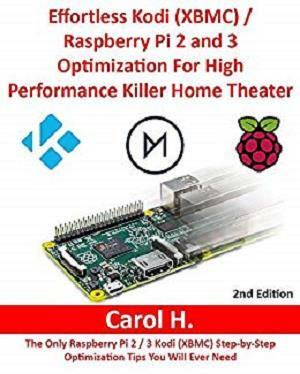 Effortless Kodi (XBMC) / Raspberry Pi 2 and 3 Optimization For High Performance Killer Home Theater: The Only Raspberry Pi 2 / 3 Kodi (XBMC) Step-by-Step Optimization Tips You Will Ever Need by Carol H.
Have you got a Raspberry Pi Kodi as your home theater setup? Do you want to improve its performance and make it even more powerful than before? Raspberry Pi's modest hardware specs is significantly below a low-end home theater PC or media center computer. But it is by design a low-power high definition media center at just USD35. Not only that, there are a few tweaks you can apply to improve Kodi performance significantly on Raspberry Pi 2 or 3. The good news is you do not need to perform highly technical task to optimize Raspberry Pi and Kodi. To be honest, optimizing Kodi and Raspberry Pi 2 or 3 is one of the easiest things that you can do. It does not take a lot of expertise to put these task together nor is it too time consuming. That is exactly what you will learn from this book. You will learn how to make the tweaks on hardware and software without the stress of worrying that it is too difficult to put together. There is a step-by-step guide in this book for everyone out there, regardless of their technical experiences. In this book, every step has one photo for you to compare before going to next. So, if you want to begin making your very own optimization with little to no effort at all, then let’s start working!